Eye On Tampa Bay: A $9 billion answer? Today the Tribune published their lead commentary, A $9 billion question, about the proposed Tampa Bay Express project by the Florida DOT, written by Brian C. Willis. There is much to dissect about Willis' commentary. First of all, Brian C. Willis, is more than "an attorney in Tampa", which is the only information about himself disclosed in the commentary. Brian Willis has been active in urbanist and transit issues for years in Tampa Bay. He is one of the co-founders and President of local transit activist Connect Tampa Bay. Willis actively supported of Greenlight Pinellas, where he spoke in support of the referendum on numerous occasions, as well as participating in denigrating its opponents. That omission of his personal positions is telling, as he is not some independent minded wise man providing unique insights on transportation issues. The Florida Department of Transportation’s $9 billion express lane plan needs further scrutiny before proceeding. There are unanswered questions about the toll lanes’ design, and DOT has not explained why investing $9 billion in a single transportation project is the best use of limited taxpayer resources. Hillsborough County has a diverse population that lives in neighborhoods ranging from rural to urban. DOT should take time to listen to the community and develop plans that reflect the needs of our entire county. Of course the plans need further scrutiny. No one has suggested otherwise, and there were in fact two FDOT hosted workshops the week of January 25. There has been no money budgeted for Tampa Bay Express, nor are the lanes designed. The only concept that exists is the general idea for tolled express lanes shared with express bus routes on Tampa Bay interstates and some rough budgetary estimates. If the plans progress, FDOT will schedule further workshops and other avenues for public comment, as is required by their process. 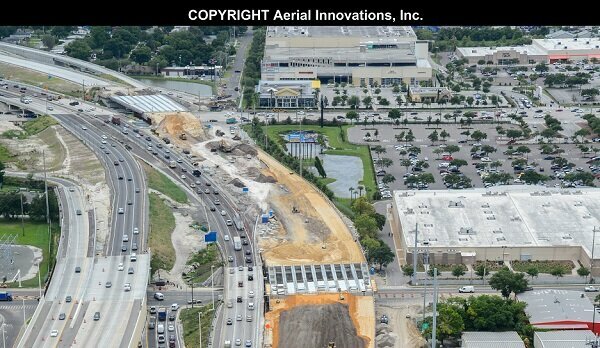 Reconstruction and widening of southbound I-275 at Himes Avenue (bottom of photo) and Dale Mabry Highway (top). FDOT is primarily responsible for state roads and bridges, and the interstate highways in Florida. Obviously highways connect to county and city roads, but those roads are the responsibility of the local authorities, not the FDOT. In support of the plan, officials with DOT cite similar toll lanes built in South Florida. As someone who had the misfortune of driving in Miami, I question whether South Florida should serve as a model for Hillsborough County. The Sun Sentinel recently reported that the South Florida lanes met DOT’s traffic goals only 59 percent of the time during the afternoon rush hour in November and December. To get traffic moving on the express lanes, DOT is now looking to raise the maximum toll in Miami from $10 to $14 — or higher. WLRN, a South Florida television station, recently reported that the Miami express lanes have come under fire because they lack space for disabled vehicles to pull over and because drivers attempt to “dive” out of the express lanes, through upright plastic dividers, and into the untolled lanes of traffic. WLRN’s report raises questions about whether FDOT’s express lane designs are safe. As a frequent traveler to South Florida over the years, traffic in South Florida, and Miami in particular, is worse than Tampa Bay. The addition of the Express lanes has improved traffic flow. I regularly drive on I-95 non-express lanes during rush hour. It is never fun, but it has improved in my experience and reduced congestion on the non-express lanes, which at times can flow faster than express lanes. WLRN is correct that the I-95 Express lanes in Miami do have design issues on some segments (I recently listened to some of those reports live on WLRN while in South Florida on I-95). However, the recently opened I-595 Express reversible 3 lanes in Ft. Lauderdale, similar in concept to the Selmon Express Lanes, are safe and convenient. It's interesting that Willis ignores the success of the Selmon Express Lanes in his own backyard, built with no taxes or highway funds. Level of service was upgraded from an "F" to an "A" as commuters are now able to travel at full speed, cutting travel time by as much as 60 minutes per day. The elevated lanes project won the prestigious "2007 IBTTA President's Award: Most Innovative Toll Transportation Project in the World," along with 22 awards for engineering excellence and community-friendly design. This modern solution is a prototype for eliminating urban traffic congestion and reducing green house gases. No on likes paying tolls, much less up to $14 for tolls. Tampa Bay is not Miami, but the demand is clearly there from the Miami drivers. The express lanes may have become a victim of their own success. The drivers clearly see value in their time and are willing to pay to save time. These drivers are voting every day by paying the tolls, which are used to maintain and fund further road improvements. Residents have strongly opposed prior toll projects, like the infamous “Green Swath of Death” beltway, which was proposed for the Tampa Bay area several years ago but never materialized. Many of the toll lanes that did get built in Hillsborough have not provided a long-term solution. I grew up in Carrollwood and remember when the Veterans Expressway opened. It initially offered a quick ride into Westshore. The road is now the site of daily traffic jams. The "Green Swath of Death" (I thought it was black) may have helped ease congestion in the highest growth areas in east and south Hillsborough County. Formally known as the Tampa Bay Beltway project, it was killed in 2007, largely since it didn't fit in with the future transportation vision of light rail and express buses throughout Hillsborough County. Where are we now? Not having the "Green Swath of Death" certainly has not inhibited development, which of course has resulted in some of the worse congested roads in the county. Even with the Veterans, the demand soon exceeded the capacity of the road. Drivers see value in paying the toll, even if they are in slow moving traffic for 5 - 10 minutes, it is still better than the alternative surface routes. Is Willis suggesting that we should not have the Veterans at all, much less the current improvements well underway, and that would improve transportation in Northwest Hillsborough? Orlando, much of South Florida and many other larger metropolitan areas rely heavily on toll roads which are highly utilized. Drivers will pay for the convenience and speed. They value the toll roads with their own hard earned dollars. Willis then transitions his commentary to local bus services, bicyclists, pedestrians and complete streets. Express buses will take advantage of any Express lanes, but bicyclists, pedestrians, and complete streets are completely irrelevant to the Express lanes discussion. If we wanted to try to reduce the number of people killed while walking or riding a bike, we could design safer “complete” streets. A recent program by FDOT to reduce deaths and injuries on Fletcher Avenue cost $1.6 million per mile. For a fraction of the cost of the express lanes we could build more complete streets and make our neighborhoods safer. The jury on "complete streets" is still out. See our report on the Fletcher complete streets project for more information. Increasing bicycling is a goal I support, but if bikes are too closely intermingled with traffic, we may further increase bicycling injuries and fatalities. By the way, complete streets include "narrower lanes" and other traffic calming measures, such as reduced speed limits, as is the case on Fletcher. Willis stated his concern about congestion and traffic of toll roads, yet he is proposing more solutions such as complete streets that are designed to create more congestion for drivers. Willis then closes with a reference to Greenlight Pinellas which he actively supported, apparently still in denial of Greenlight's overwhelming defeat by the voters in 2014, 62% - 38%. The Greenlight Pinellas plan would have added 24 miles of light rail and dramatically improved bus service in Pinellas County. Greenlight Pinellas would have cost $2.2 billion to build and operate for 30 years. For a fraction of the cost of the express lanes we could build and operate a light-rail system with an extensive bus network. Greenlight projected about 18,000 rides (about 9,000 actual riders) a day for $2.2 billion (really over $3.3 billion if you read the fine print). As a comparison, the active I-275 widening between downtown Tampa and SR-60 has nearly 200,000 vehicles per day and is costing $216.7 million. Which one benefits the most people? The voters of Pinellas held their "government ... accountable for how taxpayer dollars are spent on transportation", so Willis should be satisfied the voters had their say. Is Willis's solution to "decades of highway expansion have only led to more gridlock" is more Greenlight? We have lots of questions about the Tampa Bay Express proposal, and of course our overall transportation strategy. But we need to use more imagination and develop solutions that relieve congestion and improve mobility.